Did you ever wonder what it feels like to be a female tattoo artist in a male dominated environment? Meet Erin "Bunnie" Clayton, New York-based tattoo artist and piercer. Erin started her journey as an apprentice in late 2000, and has been inking clients ever since. In this interview she gives tips to readers on selecting tattoos and tells LoveToKnow more about her experience as a female tattoo artist. 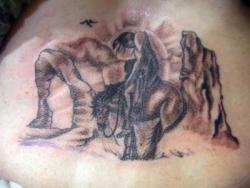 LTK: Do you have any tips for someone getting their first tat? Always take the time to look through a potential artist's portfolio. Ask any questions you might have upfront. If you don't like answer, have the courage to say no thank you. Don't ever let anyone intimidate you into getting something done on the spot. A good artist won't pressure you when you're not ready. Check out more than one studio and see where you're the most comfortable. Chances are you're going to be spending some time there so make sure the artist you choose is one you feel comfortable with, too. If you're not 110% sure you love the design, have a little patience and figure out what it is you truly DO want, and don't be afraid to say so. Also, there's a reason some work is cheap: Good work isn't cheap, and cheap work isn't good. If you do your homework before you get in the chair, you're guaranteed a satisfying experience. LoveToKnow (LTK): Tell us why you got involved in tattooing. Bunnie Clayton (BC): I've always loved art, but never thought I'd be able to find a way to make a living doing it. In college, I bounced from major to major to major. Nothing held my interest in a way that didn't make me dread doing it every day. When I got my first tattoo, it dawned on me that here was a way to do what I love and still make a living. The concept of working on a living, breathing canvas was incredibly fascinating to me. LTK: What's it like being a female artist in a primarily male worksite? BC: It can definitely have its pros and its cons. There are times when I feel like it doesn't make a shred of difference to the client; it's all about my style. There are other times when I've been mistaken (repeatedly) for counter-help merely because I'm the only woman in the shop I work at. When you get down to it, most of the artists that I've met that aren't full on old school are pretty supportive and treat you like any other artist. It's really only once in a while that it comes back as a real negative. LTK: So, do you feel that male customers treat you differently? BC: I'd say that some do treat me differently, in the way they talk or relate to me more than anything else. I've had a handful of guys be less confident in the beginning because I'm a woman, but generally, after looking through my portfolio and taking a few minutes to discuss ideas most get over it and were happy they gave me the chance. I've only had a couple of guys over the years be totally unwilling to be open-minded, but whatever - you can't please everyone all of the time, right? 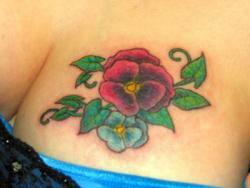 LTK: What is your favorite kind of tattoo to ink? BC: I really enjoy working with a lot of different colors and tones. 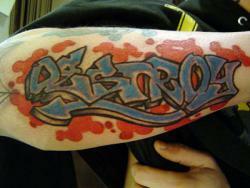 I'm a huge fan of old school tattoo art done with a slightly more modern take on coloration. I especially love anything with a girly feel though. I also really get into certain types of art, just like any other tattoo artist out there. When you're really digging on a concept or design, it's going to show in your focus and enthusiasm and it's going to show in the finished product. For more about Erin and her artistry, visit her website erinclayton.deviantart.com.